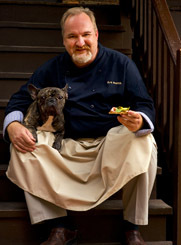 Smith is a world-renowned chef with a popular restaurant and cookbook, and is well known for his work as Oprah's chef. He donates his time to mainstream and gay causes, and is especially interested in teaching a new generation to love to cook. His support includes the Center on Halsted, where he designed their training kitchen. He and his partner Jesus can be seen around town lending their names and support to many groups.